Enjoy the tastes of the season with new holiday items and returning holiday favorites at your local IHOP® Restaurant! My husband and I went to IHOP® the other night and I had the Caramel Bon Bon Pancakes. And let me tell you they were AWESOME! 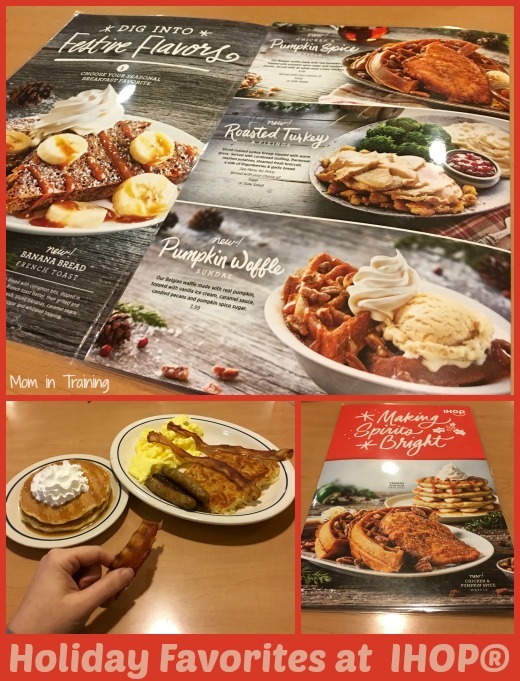 I like to order breakfast when we go to IHOP® so I was pretty excited to see their holiday menu had several limited time only breakfast choices. I think we are even planning to make a family trip for breakfast Christmas Eve since my husband is also off work. I want to be able to enjoy a stress free day and breakfast at IHOP® sounds to me like the perfect way to start it off. And of course that means I don't have to start my day out cooking. • NEW Banana Bread French Toast - Banana bread with cinnamon bits, dipped in our vanilla French toast batter, then grilled and topped with caramel sauce, powdered sugar and whipped topping. • NEW Pumpkin Spice Waffle - Our Belgian waffle made with real pumpkin, sprinkled with pumpkin spice sugar and whipped topping. • NEW Chicken & Pumpkin Spice Waffle - Our Belgian waffle made with real pumpkin, topped with pumpkin spice sugar and candied pecans. Served with all white meat crispy chicken. • NEW Pumpkin Waffle Sundae - Our Belgian waffle made with real pumpkin, topped with vanilla ice cream, caramel sauce, candied pecans and pumpkin spice sugar. • NEW Roasted Turkey & Fixings - Sliced roasted turkey breast topped with warm gravy. Served with cornbread stuffing, Parmesan mashed potatoes, steamed fresh broccoli & a side of Lingonberries. • Caramel Bon Bon Pancakes - Buttermilk pancakes layered with Dulce de Leche cream then topped with a drizzle of caramel sauce and whipped topping. • Toasted Marshmallow Hot Chocolate - Hot chocolate flavored with Toasted Marshmallow syrup, finished with whipped topping and finished with cocoa powder. • Pumpkin Coffee - IHOP restaurants’ 100% Arabica International House Roast Original™ coffee with a touch of pumpkin syrup, made with real pumpkin, and then crowned with whipped topping and a sprinkle of pumpkin spice sugar.